The impact of Assam NRC is now reflecting in neighbouring state also. AAPSU served 15 days ultimatum to people living without ILP to leave state. Fearing that many refugees whose names does not figure in the final draft of National Register of Citizens (NRC) released on July 30 last might sneak into the state to evade the deportation exercise, the All Arunachal Pradesh Student Union (AAPSU) has decided to launch operation clean drive to thwart possible infiltration of such illegal immigrants into state. A committee headed by Tatung Taga will be helping concerned authority in assessing the situation who on its part will conduct spot verification at all the entry and exit points in various districts and help in driving out those taking refugee in the state without valid documentation. 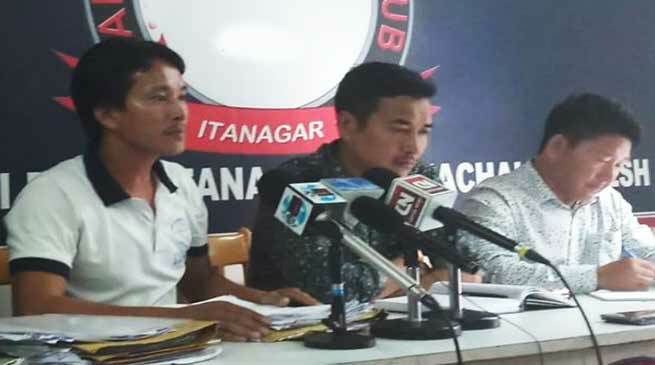 Addressing the media at a press conference at Arunachal Press Club here today AAPSU General Secretary Tobom Dai informed that the union is fully prepared to tackle the projected consequences of the NRC and warned those taking refuge without valid documentation to leave the state within 15 days. In this connection, Dai appealed government to come out with strong anti-influx measures by constructing more and more outposts at Tezu, Pasighat, Banderdawa,Roing, Hollongi, Bhalukpong, Deomali, Dirak etc to check the menace of unabated influx of illegal immigrants into state. Referring to its recent survey conducted to check illegal migrants in areas bordering Assam such as Gumto, Doimukh and Banderdawa etc, AAPSU leader Tatung Taga claimed that as per their finding there are many shops under Banderdawa which are allegedly issuing illegal ILPs to outsiders without notice of concern issuing authority. “Our intervention into the development led to arrest of 8 agents who were issuing illegal ILPs and others still absconding,” he informed adding the accused admitted this before police during preliminary investigation. “The development also creates a doubt about the veracity of ILP issuance being commercialised and the involvement of some officials also cannot be ruled out,” observed Taga. Informing that there are many vulnerable locations using which many trespass into our territory, he said despite tall claims of state government many still illegally enter into the state through crossing the rivers to evade checking at out posts or using route which are less guarded. Further Taga also asked people living in interstate boundaries to be vigilant and requested rent owners to properly verify the identity of the tenants before giving them space.